If you want to learn how to drink like an Italian, you’re going to need to know about the most popular Italian beverages and when to order them. Italy is bursting with culture and tradition, and these 8 Italian drinks are a huge part of it. You can’t possibly go to Italy without learning about the aperitivo culture that will allow you the opportunity to become acquainted with the Italian drinking culture. Before we get into the list of drinks that should make your list of sips to try in Italy, let’s get into this drinking culture I mentioned. In Italy, the concept of Italian aperitivo is so much broader than just grabbing a drink. It’s a time to get together with friends, sit down for a drink and chat before dinner, and to enjoy an Italian alcoholic beverage that is meant to prepare the stomach and the senses for a meal. Aperitivo takes place typically between 7-9pm and it consists of a drink and some finger foods. You may find a different set up at each bar that participates in aperitivo. It can range from a small assortment of snacks, like olives and bread, to a full buffet spread that can easily replace your evening meal. You may pay a set price to have access to the food, and you’re expected to purchase a drink as well. Although in some places, the drink is included in the set price. You don’t have to partake in aperitivo before every meal, but if you’re attempting to fit into the Italian culture, it is highly recommended. It’s one of the most beloved Italian customs there is – it would be a shame to miss out. What you order is really up to your preference. There are many Italian alcoholic drinks you can choose from, but there are non-alcoholic choices as well. Wine is a popular choice, but so are cocktails. There are many types of Italian liqueurs that go into these cocktails, that will check a few drinks you must try off the list for you. Practically all of Italy is a vineyard, so you’re always in wine country, no matter where you’re visiting. Aperitivo is a great chance to order a wine you love, or haven’t yet tried. If you’re not able to visit any of the wineries in person, this can be a great chance to try a few wines by the glass to familiarize yourself with the tastes, aromas and terroir of the area. Some of the most prominent wine regions in Italy are Tuscany, Piedmont, Veneto, Marche and Abruzzo, Lombardy and Sicily, but there are many many smaller regions around the country. If you’re in any of these main regions, you’ll have no trouble finding plenty of wine to enjoy. Your only problem will be choosing from the inevitably long wine list. Read more about where to find the best Italian wine. If you prefer sparking wine, Prosecco from the Veneto region should be your drink of choice. It’s crisp and light, and the bubbles make the ideal aperitivo. You’ll find that it’s a favorite among the locals. Prosecco is often offered as a pre-dinner drink, or as you’re looking over the menu trying to decide what to eat. It makes for a very refreshing way to start your meal. As mentioned, Prosecco is produced in the Veneto region and in Friuli Venezia Giulia. If you’re in Venice or the surrounding region, you absolutely should make some time to visit a Prosecco producer during your trip, to learn how this delicious sparkling wine is made, and to taste some of the best of the area. Look for Prosecco Superiore, which means you’re getting the very best. A drink of choice for many Italians, and now a drink enjoyed around the world, an Aperol Spritz is a refreshing and palate pleasing drink. It mixes Aperol with Prosecco and tonic water to make a bright orange, fizzy spritz. Aperol is made from bitter orange, rhubarb and herbs, it has a very unique bitter and sweet flavor, along with complex herbal aromas. It’s not as bitter as Campari, so it is often chosen over a Campari spritz. The Aperol Spritz was invented in Venice as a drink to pair with ciccheti (small snacks that are served pre-dinner). If you travel to Venice today, you’ll find people all around the city drinking Aperol Spritz, not just as a pre-dinner drink, but all day long. It’s the perfect drink for a long, hot afternoon being a tourist around the crowded city. Many bars offer specials on Aperol Spritzs throughout the day. If you do happen to be visiting Venice, make sure you ask to have a Select Aperol Spritz instead. Select is a slightly different recipe of Aperol and it’s a lot more exciting, if you ask me. It has slightly less bitterness, more spiciness, and less sweetness. Better all around. The only place you can reliably find Select is in and around Venice. Yes, there are two popular Italian spritz that you should try. Campari is a more bitter liquor than Aperol. If you’re not someone who likes bitter flavor, you may not like Campari. But we’ve always found that when it’s mixed properly with the other components of the spritz, it isn’t that bitter, and it’s actually quite refreshing. You make it just like the Aperol Spritz, with Prosecco and a splash of tonic water. Usually it’s garnished with a green olive, which goes surprisingly well with the bitterness of the alcohol. The liquor itself is made by infusing alcohol with herbs and fruit. Campari was invented in Novara, Italy (not too far from Venice), in 1860 by Gaspare Campari. If you like mixed drinks, you may already know that Campari is one of the main ingredients in a negroni cocktail. In Italy, it is customary to order a digestivo after a heavy meal, in order to aid your stomach in disgestion. You’ll often see a large family meal taking place and no one leaves the table until after the digestivo is served. We’ve had a few meals in Italy where the bottles of available digestivos are brought to the table for us to choose which we’d like. There are dozens of choices. I personally love limoncello after dinner, because it substitutes for dessert, but most digestivos have herbal properties that are said to aid in digestion. Whether you choose an herbal digestivo is up to you. It’s still up for debate if it actually does something for your stomach, so choose whatever you enjoy drinking! Amaro means “bitter” in Italian and that’s just what you’ll get if you order Amari. It’s a bitter, herbal infused liquor, often made from a complex mixture of herbs and bitter peel (orange or lemon). There are many different versions of Amari. Many come in various bright colors and can taste a bit like cough syrup, if you’re not used to it. The Italian brand, Fernet Branca, is an example of amari. It was invented in Milan in 1845 as a stomach medicine and is made with 27 different herbs. If you want to learn more about amari, check out this book. One of my favorite drinks from anywhere in the world is limoncello. It’s a digestivo and a fantastic way to end a meal, because it can easily replace dessert, due to its sweetness. It’s a lemon liqueur, containing between 25% and 30% alcohol. To make it, you steep the pith and peel of lemons in a strong liquor, often Grappa or Vodka. After a period of time, the liquor starts tasting strongly of lemons. Although the exact origins of the drink aren’t known, it has been made for at least 100 years, typically in southern Italy. It’s the second most popular drink in Italy, after Campari. And its popularity is picking up around the world. You can even make it at home quite easily. I sometimes think grappa is an acquired taste, because it can be very high in alcohol and leaves that burning sensation as it goes down. 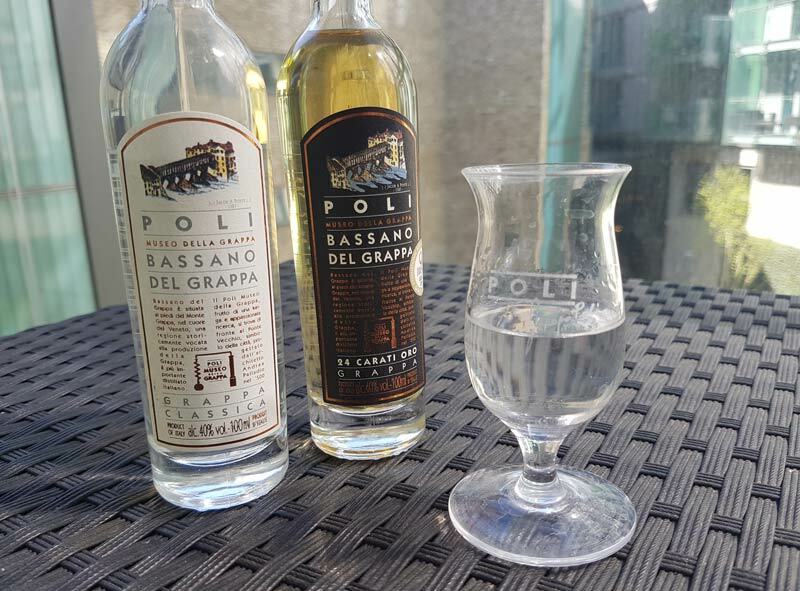 There are many different variations of Grappa, however. If you can find the right one for you, that is when you will have acquired the taste. Grappa is made from the stems, seeds and skins of grapes that are used in winemaking. A lot of the aromatics and flavor of the grape can be found in the skins, and using them to make Grappa transfers that essence to the liquor. That is why Grappa has a grape and pepper taste to it. It’s typically made to be between 35-60% in alcohol. For a smooth, easier drink, look for ones around 37%. Grappa that has been aged longer also tends to be smoother, with more caramel flavor. The type of glass used to drink Grappa is a small tulip. It has a slightly flared brim to allow the aromas to waft from the glass as you drink. Learn more about choosing the right type of glass for various drinks. Another popular sweet digestivo (like limoncello) is Sambuca, a colorless, anise-flavored liqueur. It has a minimum of 38% liquor. Sambuca goes particularly well with coffee and is often served alongside or even in a cup of coffee. It balances the flavor of the sweet anise. If you don’t like licorice, you may not like Sambuca, but you should give it a try at least once. You might be surprised. Make sure you ask for white Sambuca to get the clear version. There are two other versions – black Sambuca and red Sambuca. Like this post? Why not share it on your Pinterest board? Just over over the image to pin it! ⇒ As you’re enjoying your Italian drinks, make sure you know how to properly say “cheers” in Italian. Traveling to Italy brings with it many opportunities to try the local food and drinks. If you want to do it like a local, you really have to embrace the tradition of apertivo and digestivo. With the drinks above, you’ll be able to order easily and try many different drinks. If you have a favorite Italian drink that we didn’t mention, let us know about it in the comments. Cin Cin!